Although both the export and import of China shrank in the first half, new impetus is growing, which will fuel foreign trade and make more contributions to global trade, according to People’s Daily. In the sixth trade policy review of China by WTO, progress made by Chinese foreign trade was recognized by members. Many countries wanted to become trade partners with China. Apart from the progress, the status quo of Chinese foreign trade had been closely watched. In the first half, the value of China’s ordinary trade — import and export without processing — accounted for 56.4 percent of the total foreign trade, up 1.2 percentage points compared with a year ago. Exports by private enterprises rose 3.6 percent, accounting for the largest share of the total. “The growth of general trade proves the growth of Chinese innovation,” said Zhang Jianping, an expert from the National Development and Reform Commission. He also said that the rise of exports by private enterprises is beneficial to the structural transformation of foreign trade. The expansion of multiple and bilateral trade partnerships has been bringing more opportunities for foreign trade. For example, trade with some countries along “the Belt and Road” rose in the first half, and China has signed free trade agreements with 22 countries or regions. Processing trade, however, had some trouble. According to data from the General Administration of Customs, its volume dropped 9.8 percent in the first half, a consecutive decline for more than a year and a half. “Traditional trade, including processing trade, is still very important for China, because it creates many jobs and secures a balanced trade,” Zhang Jianping said. He added that China should maintain the advantage in processing trade and promote its status in the value chain. Positive factors exist in traditional trade. First, industries that pillar processing trade in east costal China are migrating to the middle and west. Second, the export of labor-intensive products rebounded in the first half. 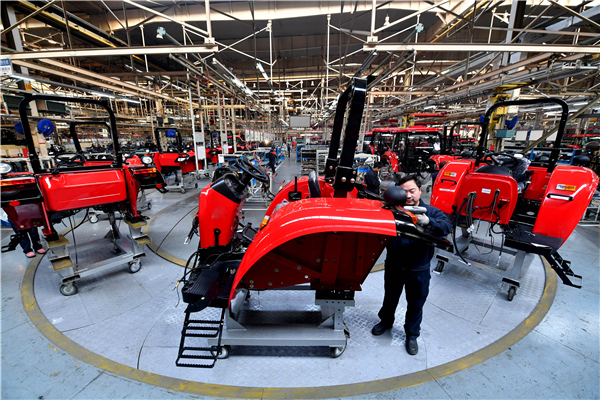 “Machines are replacing humans in labor-intensive industries, lowering their cost and boosting their competitiveness,” according to Pan Jiancheng, an official from the National Bureau of Statistics. Although new impetus is bringing energy, Chinese foreign trade still faces pressure both at home and abroad. The World Trade Outlook Indicator launched by WTO on July 8 read 99.0, slightly below the current trend, which suggests a sluggish global trade growth into the third quarter. In addition, 61 percent of Chinese enterprises said the rise of costs including labor, financing and land is hindering the trade business, according to statistics by the General Administration of Customs. “To tackle the obstacles, the government should cut more red tape, implement policies that support foreign trade and provide more effective service. Enterprises should run more businesses that are in line with the new impetus,” according to Zhang Jianping.